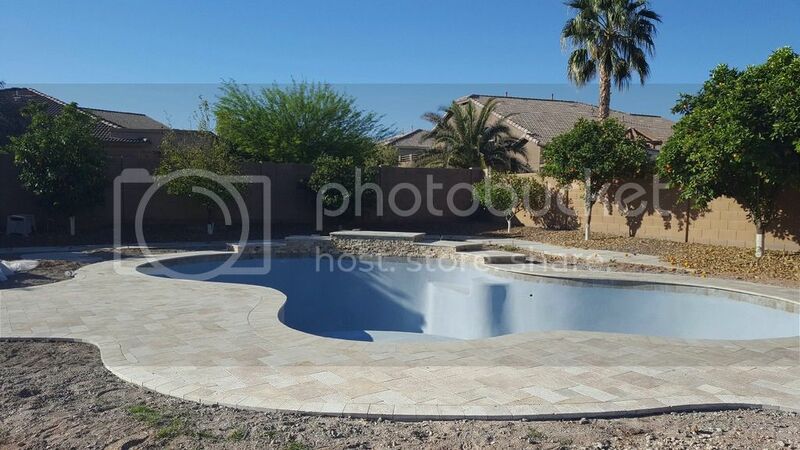 Started our pool build 10 weeks ago in Arizona. Miss this grass already. It's been stressful, wish I would've known about this site prior to dig, but we're excited to spend the hot summer months in the water. What I love about the pool: Baja step, 2 benches in deep end, water feature for kids to jump off, deep end, travertine decking, 2 multi-color pool lights. Regrets: 1) Would like darker travertine. We chose travertine from pool company. Should have gone to a tile store, with more selection, brought travertine pieces home, and placed in backyard to see what looks best. (Also, this light travertine color is bright in the sunlight.) Choosing our own travertine contractor, instead of paying pool builder, would probably have been less expensive. 2) Should be a larger shallow end, including a long bench, connected to Baja step. I realize I can’t dwell on this. What's done is done. Kids will enjoy pool, and likely nobody else will notice my complaints. Looks great! What kind of finish did you choose? We want details! Finish is called Kona Blue Pebble Radiance. It looks beautiful!! Also, I really like your choices! A benefit of light travertine is that it stays cooler underfoot than the darker colors. And too shallow = less swimming space. What are the dimensions and depth of your Baja step? I'm waiting on my permits now. 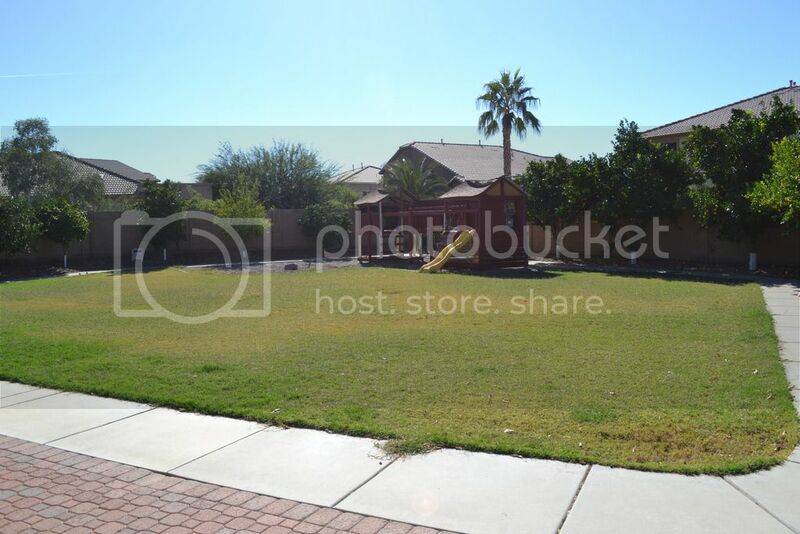 I'm in AZ too, the east valley - near Queen Creek. Thank you. Baja step is 15 inches deep, and approximately 8x11 feet. Katie, you'll be loving that lighter travertine come summer. Trust me. Once it weathers a bit it won't be bright. Silver and linen travertine can get bright, but yours looks like a light noche which will be fine in the sun. SMILE it's gorgeous! We have travertine and love it. We went to an outdoor showroom of several travertine colors. In the hot July sun, there was a noticeable difference on the bare feet between the light and darker travertines. We went with a light noche mixed with classic (very light) colors. It is great around the pool when the sun is scorching. It does get warm on the hottest of days but not sizzling hopping hot. And it's amazing how quickly it cools off when shade hits it. Our concrete driveway stays hot in the shade. I waited to seal ours to decide if I wanted an enhancer or not. The test for that is to see how you like the travertine wet. Water brings out the patterns and colors. We just sealed and enhanced it ourselves. We love it. It's a shade darker - hoping it won't be noticeably hotter. Sealing it was far easier than I expected. I really think you'll grow to love it! I hope so. Your pool looks fabulous! We also have a deep end and love it! I can't wait to see it with water! So, I'm assuming you don't think the travertine is slippery?? That is really my only concern. My travertine is tumbled and unsealed and is definitely NOT slippery. Hmmmm - do you have SWG? What color is yours & would you do the same color again? Silver seems to be the rage right now! Silver is beautiful but it can be bright in the Az sun. I have a SWG. The travertine I have is called Noche, but it seems to be a lighter blend. My PB doesn't use Mexican travertine as he claims it is a softer stone. Okay, thanks. I will do more research on it - I love the way it looks. 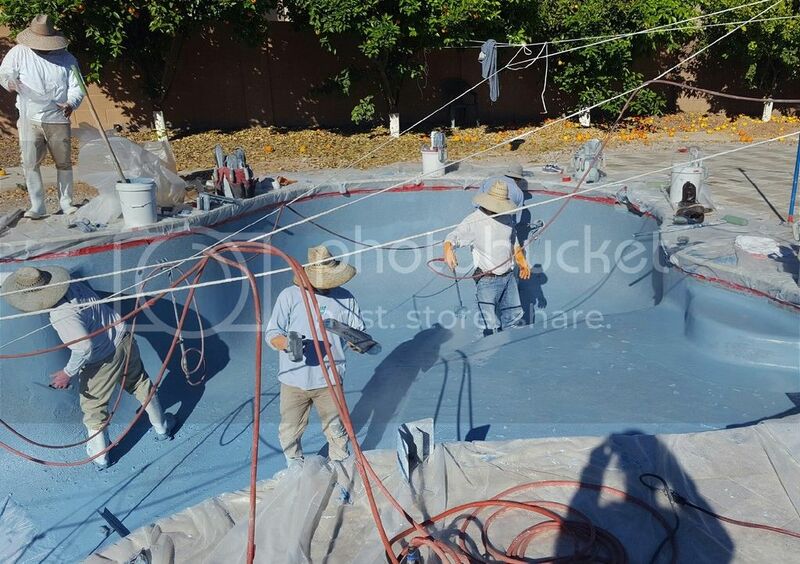 Pool was finished filling with water at 4 a.m. this morning. Pool builder is coming Monday with the start-up kit. Beautiful pool I have an A&A in-floor cleaning system in Arizona as well. I LOVE it, makes pool maintenance a breeze. I never have to sweep except for the odd spot every few months that gathers heavier debris that can't get pushed to the drain. No one cares about the pop ups either, as they stay down and flat while people swim. A lot of people say not to go in floor cleaning, but I think it can work depending on your circumstances. Living in a climate with only very light debris and some dust is much easier for the system to work in vs a place with heavy leaf downfall and freezing temps. My 2 cents! Grats on the pool!